Welcome Dreammakers, to THE CINEMARQUEE'S "INTERNATIONAL FILM RESOURCE ENSEMBLE": ... where all dreams are possible and where Heroes and Villans that were ... always will be. Sit back now in a soft lounge chair, with your favorite merlot or cappuccino and a favorite friend ... and drift with the fog, filling your imagination with dreams that are and may be. We Filmmakers are creators of worlds, dreammakers and sculptors of the imaginary, carving characters and worlds out of thought, and bringing forth through the magic of illusion ...that which might be, and for two hours of precious time...is ... if but for a moment! Welcome to Flicker, home page for the alternative cinematic experience. Here you will find films and videos that transgress the boundaries of the traditional viewing experience, challenge notions of physical perception and provide cutting edge alternatives to the media information technocracy. The MEGA MEDIA-LINKS index is the best electronic media index on the web. It contains thousands of film, video, radio, television, cinema and new-media site listings conveniently categorized, sub-categorized and cross-referenced with brief site descriptions. An index of Movie and TV resources thoughtfully organized and annotated by a film industry professional. The purpose of this site is to function as a guide to enable users to get a handle on the vast number of motion picture and television resources that exist on the Internet. The IMDb is the ultimate movie reference source and covers everything you could ever possibly want to know about movies. Movielink is the online movie download service where you can download hundreds of new releases, Hollywood hits and classic films right to your computer. No DVDs to return, no late fees, no subscription. Just download movies and watch when you want. And with a laptop, take your movies on a trip and never worry about returns! MovieWEB has previews to 1997 & 1998's hottest movies. Each movie has its own webpage which lets you download movie pictures, movie posters, production notes, Quicktime videos (of the theatrical movie trailer) and as much information about the cast & synopsis of the film which is currently available from the studios. Hollywood Online® is the premier Web site covering both Hollywood and the motion picture industry. Lists contact information for the entertainment industry, locate TV & film producers, find agents, managers, movie studio & television executives, distributors & new media companies, hollywood job board lists employment opportunities available in show business. The ShowBizwire is the ultimate guide to entertainment news on the web. The world wide web has always offered more than conventional media when it comes to up to the minute information on entertainment. 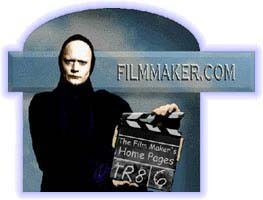 If you write horror screenplays (or if you want to) then this is the site for you.